Greek ecclesiastical writer, Bishop of Portus, and the first “Antipope.” He was an orthodox Father of the Christian Church, a Roman Catholic Saint, and a disciple of Irenaeus. Author of a large body of early ecclesiastical writings, among which is the famous Apostolic Tradition which was highly influential on the developing liturgy of the Roman Church, and a 10 volume series titled Elenchos, or Refutatio Omnium Haeresium (Refutation of All Heresies). This work was intended primarily as a polemic against the gnostic and other heresies. It includes relatively accurate and detailed descriptions of a number of Gnostic systems. What makes Hippolytus unique, however, among the early anti-gnostic writers is that he quotes extensively from the condemned writings of the heretics in framing his arguments against them. Since those writings have been systematically sought out and burned by the builders of the hierarchical Christian Church, Hippolytus has provided us with a rare glimpse at the actual writings of some of the most prominent Gnostics, particularly Simon Magus and Basilides. (See entries for Simon Magus, Basilides, and Valentinus.) The first book of the Refutatio, known as Philosophumena or “Philosophical Teachings” has been known since the middle ages, and a manuscript containing books four through ten was discovered in 1842. Books two and three remain lost. 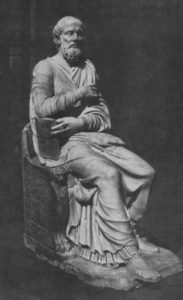 Hippolytus is also remembered as a leader of the opposition against the corruption, viciousness, and doctrinal wanderings of the early Bishops of Rome (who were later to be re-named “Popes”). Due to the strength of his opposition against “Pope” Callistus I (217-222 e.v. ), Hippolytus was elected as a schismatic Bishop of Rome (“Antipope”) by a circle of his followers. He and his group remained in schism through the terms of “Popes” Urban I (223-230 e.v.) and Pontianus (230-235 e.v.). He and Pontianus were both exiled to Sardinia by the Emperor Maximinus Thrax (235-238 e.v. ), where Hippolytus and Pontianus achieved a reconciliation. Both agreed to resign their positions to make way for Pope Anteros (235-236 e.v. ), before they died in exile. There is a statue in the Vatican Library (see above) that bears a 16th century plaque identifying it as a statue of Hippolytus, but its actual identification with Hippolytus has been questioned. The “Refutation of All Heresies” may be found here.